I'm so excited about the upcoming movie Fantastic Beasts and Where to Find Them. I've professed my love for Harry Potter on this blog before... many times... so to have more fiction set in this world is a dream come true. 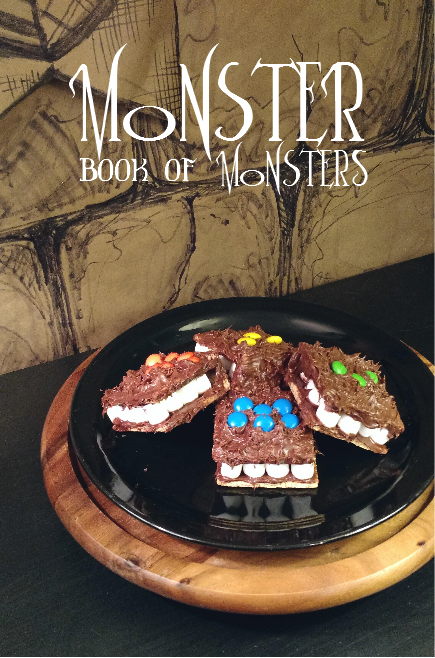 To celebrate, I thought I'd share one of our favorite Harry Potter themed snacks to make with kids: the Monster Book of Monsters. 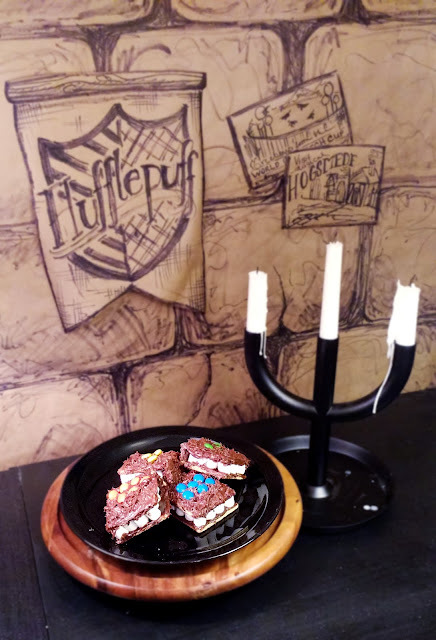 This recipe is adapted from Rosanna Pansino's Textbook S'mores, which you can see in her video here, or read about in her book Nerdy Nummies. And, of course, the Monster Book of Monsters is from Harry Potter and the Prisoner of Azkaban by J.K. Rowling. 1: Crack your crackers! You'll need to break 1 whole one in half, then ice one side. 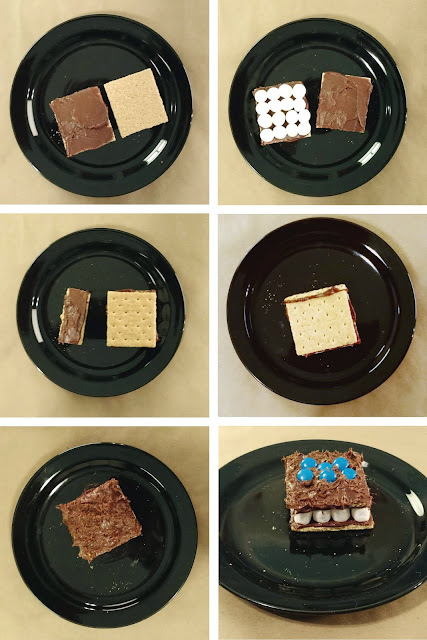 2: Place the marshmallows onto your iced graham cracker. Make sure at least one side is even, because these will be your teeth! 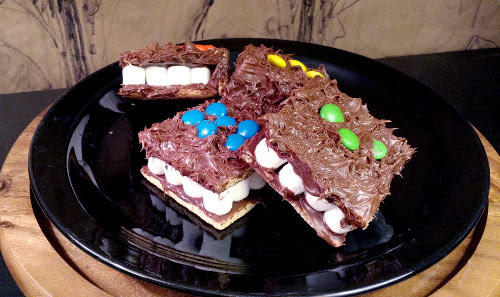 3: Ice the other half of your graham cracker, and place it on top of the marshmallows to make a delicious sandwich. Or, in this case, a book! 4: Break your second cracker in half, and then in half again. Ice one side of 1/4th graham cracker with a LOT of icing. Just like when you build a gingerbread house, the icing is your glue. 5: Place the 1/4th cracker on the side of your "book." Hint: pick the side you like the least! 6: Let everything sit and harden for a little bit. This is the perfect time to pick out your M&Ms! They will be your eyes, so pick whatever color and amount you want. 7: Time to ice your book! Once you've covered the top and the graham cracker side, dab at it with your knife. This will give you a great fuzzy texture. Bonus: this method makes hiding mistakes very easy. 8: While your icing is still wet, take the M&Ms you picked in step 6, and place them on top in any pattern you want. 9: Enjoy, but watch out, it might bite! We have used this snack multiple times at work, with all ages of kids, and it's always been a hit. It's messy, but isn't that the best kind of fun? Looking for some more Harry Potter DIYs? 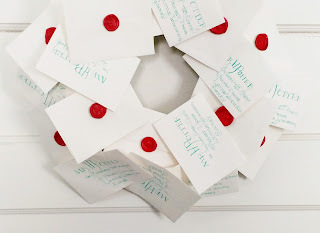 Check out my Hogwarts Letter Wreath! Do you think these could be made a day in advance? Yes! I think they would hold up pretty well, but the icing and marshmallows might get a little stiff.